There were two distinct angles. In the first, my imagery comes from the perspective of ‘looking back’ as a remembering child, the other ‘looking out’ as a remembering adult. Both are informed by my interest in and making of patchwork quilts. 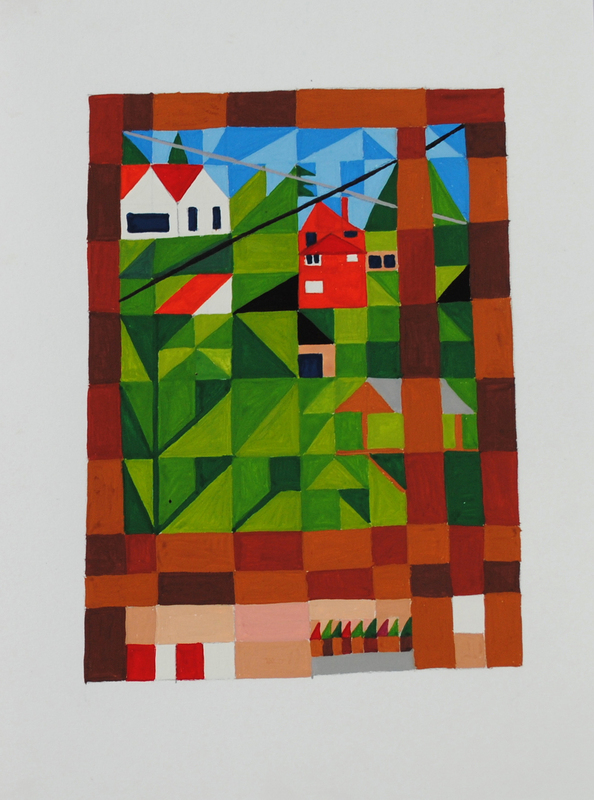 These works started as abstract designs for quilts but evolved into becoming small scale gouache paintings with personal meaning and narrative. ‘Looking back’ represents key remembered places from my childhood. I work with very little use of reference, drawing from the stories and memories and therefore an imagined link to the feelings, places and events I remember. The intention of the works such as The Farm and Hayfever is to create a very flat façade. This façade and the buildings represented contain these memories but do not reveal them. Produced within a grid structure, like a patchwork, the works are heavily stylized. 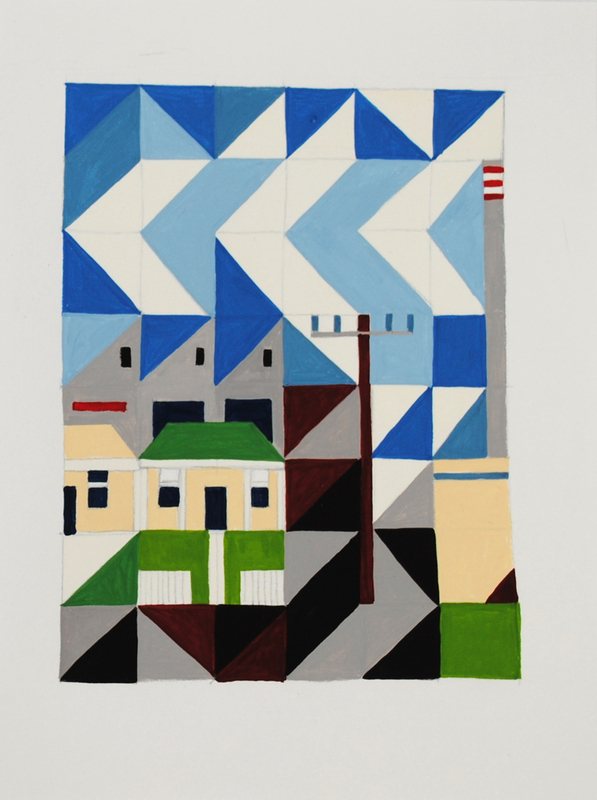 This making process relates to my childhood experience of learning to hand piece patchwork from my mother, sitting around the big wooden kitchen table at the farm, in the Strezlecki hills of Gippsland, overlooking the Latrobe Valley. While referencing the idea of ‘the remembered child’ the work is also connected to a child’s way of making, using simple shapes, colours and perspective. ‘Looking out’ from the windows of my recently 1st purchased family home in the hilly and bushy surrounds of Montmorency I am the ‘remembering adult’. Works such as Monty View, Kitchen are remembering the past, a view reminiscent of the childhood memories from the farm, looking out across a valley. The interior is not visible but is the location of the current collection of stories, thoughts and feelings. 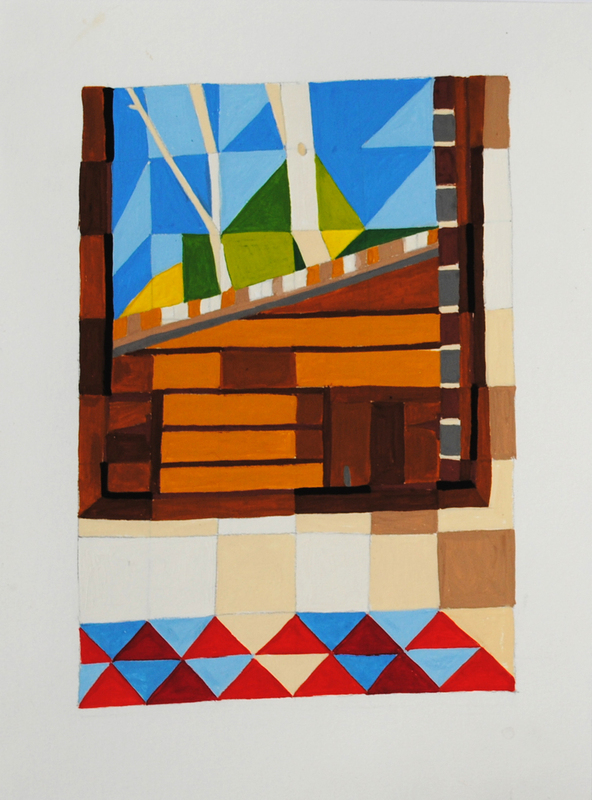 While the making method of these paintings continue the constrained format and patchwork reference, the works are a view to outside.